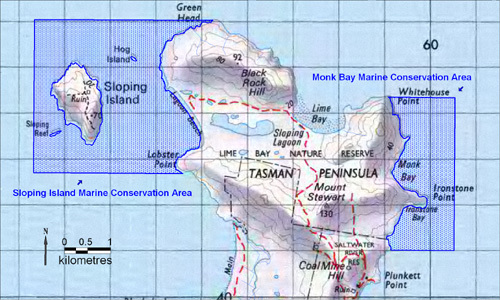 The Monk Bay Marine Conservation Area is located in Norfolk Bay off the central northern region of the Tasman Peninsula between Whitehouse Point in the north and Ironstone Bay in the south. It comprises an area of 399.2 hectares and encompasses sheltered habitats with sandy beaches and sandstone platforms. There are significant offshore areas of highly productive seagrass (Heterozostera), seaweed (Caulerpa) and also soft silty benthic habitats in the relatively deep waters off Whitehouse Point. Seagrass ecosystems have a high biodiversity, support complex food webs and play an important role in a wide range of nutrient cycling processes and primary production. They also provide nursery habitat and refuge for a number of organisms including crustaceans, molluscs, fish; sharks, stingrays and rays. Seagrass is a relatively rare habitat for the Bruny Bioregion and the reserve is significant for conservation of these ecosystems and as a scientific reference area for seagrass habitats.